In 1993, five-year-old Michel Chikwanine was kidnapped by members of a rebel militia while he and some other boys were playing in their village in the Democratic Republic of Congo. The boys were drugged, subjected to psychological and physical torture, and forced to serve the rebels’ violent agenda. 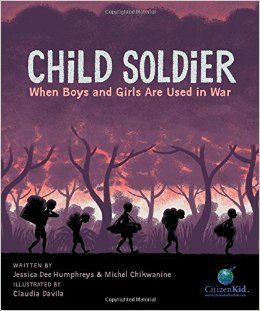 Child Soldier: When Boys and Girls Are Used in War is Michel’s story, and so much more. Told in graphic-novel format via the bold art of veteran illustrator and author Claudia Dávila, and co-authored with Jessica Dee Humphreys (who also co-wrote the chilling They Fight Like Soldiers, They Die Like Children with Roméo Dallaire), Child Soldier conveys Michel’s horrific experience with sensitivity, insight, and skill. But the book goes beyond simply telling Michel’s story, also providing readers with relevant information about the geography and history of the country. Political and civil unrest are framed by the ordeals faced by Michel’s family even after his escape, including those involving his father’s activism and death, the disappearance of his sisters, life as refugees, and immigration to Canada. The book is a worthwhile addition to Kids Can Press’s CitizenKid series, with addenda rich in information about global unrest, the plight of child soldiers, and ongoing efforts to help stop the practice of kidnapping and conscripting children to fight in wars. But Child Soldier is more than just a non-fiction teaching tool in an accessible format. It’s also the inspiring story of a young boy who, despite being used by evil men as a pawn for the purpose of killing, came out of his experience with a greater appreciation and understanding of the goodness and value in caring and doing for others. It’s a lesson Michel continues to practise and promote as a speaker and activist.